This chapter covers the analysis of referendum practice in Denmark – a consensus democracy with a strong constitutional basis for the holding of referendums, and where no less than nineteen referendums were held between 1950 and 2017. It provides an outline of available referendum provisions and the context in which these were institutionalized and used. It then analyzes these practices on the basis of this study’s six independent variables. 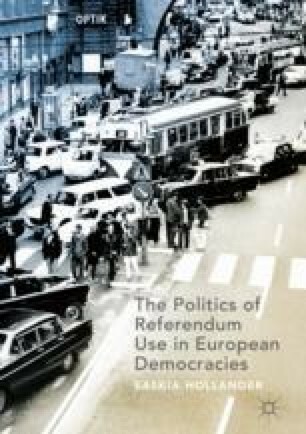 The chapter shows that the strong constitutional referendum requirements make them largely unavoidable and decision-controlling, especially when the EU is concerned. However, both government and opposition parties have an important role to play in triggering them, making them also an outcome of party politics. Also in Denmark, referendums on EU-affairs mainly serve to mediate and depoliticize controversy over the EU. Miller, V. 2000. The Danish Referendum on Economic and Monetary Union. House of Commons Research Paper, 00/78, 1–24, September 29. files.parliament.uk/documents/RP00-78/RP00-78.pdf. Accessed 2 Dec 2015. Sørensen, C., and A.M. Vestergaard. 2005. A Perilous Democratic Exercise: The Referendum on the Constitutional Treaty in Denmark. Dansk Institut for Internationale Studier (DIIS) Brief, 1–7, May 20. https://www.ciaonet.org/attachments/6749/uploads. Accessed 15 Mar 2015.